Uzbekistan's government is actively encouraging foreign investment, particularly in the processing industries for its raw material output. The January 1994 decree put into law a number of tax incentives for foreign investors, formally laid out guarantees for property protection, and promised a faster and less bureaucratic method of registration for foreign concerns. Other areas in which the Uzbeks would like to encourage foreign investment include the financial sector, energy production, extraction and processing of mineral raw materials, textiles, telecommunications, tourism and ecology. All foreign companies currently have to be registered with the Ministry of Foreign Economic Relations. Uzbekistan has not been too affected by the global economic downturn, due to its relative isolation. However, while the country registered an impressive 8.5% growth in 2010, according to the World Bank in 2013, GDP growth is anticipated to slow to 7% as Uzbekistan’s trading partners battle the financial crisis. Agriculture still makes up one-third of the annual GDP and provides livelihoods for 60% of the rural population. Livestock is reared in the steppes while a variety of crops, including grains, fruit and vegetables, are grown in the more fertile valleys. Due to its badly planned boom in irrigated agriculture, Uzbekistan consumes well over three-quarters of all of the water available to the Central Asian region. This is a disaster for many reasons, most famously the huge withdrawal of the Aral Sea, but also less publicized, general waterlogging. 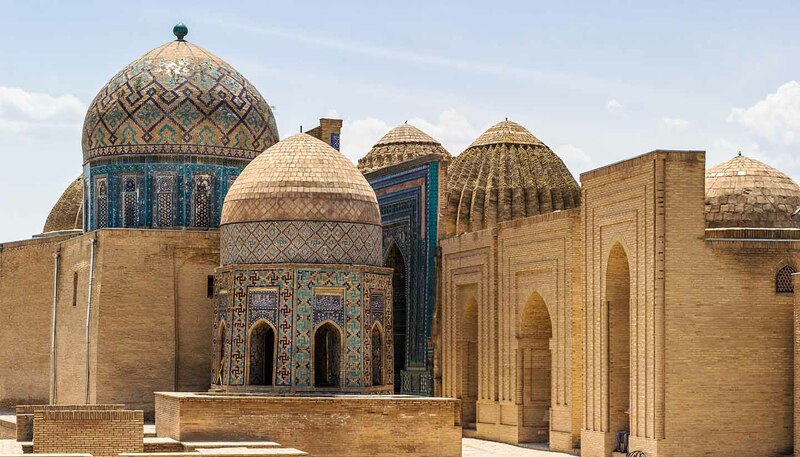 Some of Uzbekistan's economic policies – such as a difficult currency conversion rules – have driven back potential foreign investors. While now official full currency convertibility has been applied for a decade now, strict controls mean it is not effective. While all foreign companies currently have to be registered with the Ministry of Foreign Economic Relations (which can open the door to all manner of bureaucracy), Uzbek companies remain keen and encourage foreign investment for areas such as energy production, textiles, telecommunications, tourism and ecology. Import taxes – which can amount to as much as 150% of the actual value of the product – are applied to protect locally produced goods, making imported goods unaffordable for nearly everyone. Cotton, gold, natural gas, mineral fertilisers, ferrous metals, textiles and motor vehicles. Machinery and equipment, food, chemicals and metals. Russia, China, Kazakhstan, Republic of Korea and Turkey. International calls can be made from main post offices (in Tashkent on Prospekt Navoi). Direct-dial calls within the CIS are obtained by dialling 8 and waiting for another dial tone and then dialling the city code. Calls within the city limits are free of charge. Mobile connections works in most parts of Uzbekistan and services are cheap. The number of mobile phone service users exceeded 19 million people by the end of 2010. The number of internet users was estimated at 7.55 million in March 2011. Internet cafés exist in Tashkent, Bukhara, Samarkand and Khiva. Pre-publication press censorship has been abolished but self-censorship is widespread. A law holds media bodies accountable for the impartiality of their output, and as a result many locals depend on Russian TV and the BBC for news. Reporters Without Borders (RWB), who publish the World Press Freedom Index, placed Uzbekistan at 164th place in 2013, in between Saudi Arabia and Bahrain. In August 2011, the government approved the creation of a new ‘committee of experts on information and mass communication’ that would monitor the media for news that could weaken national cultural traditions, or that could help to induce violent overthrow of the government. In addition, the government, concerned about the Arab Spring uprisings in the Middle East and North Africa, restricted the internet and social media in 2011. Authorities also ordered the closure of the decade-old Zerkalo XXI, one of the few independent newspapers left in the country. Foreign media have been gradually expelled since the 2005 Andijan uprising. The main editions are published in Tashkent and include Khalk Suzi and Narodnoye Slovo (in Russian and Uzbek), Hurriyat (published by a government agency) and Uzbekistan Ovizi. Television channels include the National Television and Radio Company, the NTT and TV-Markaz, which is national and is watched for music and entertainment. There are several radio stations, some national and some private – these include the National Television and Radio Company, Oriat FM, Uzbegim Taronasi and Radio Grande. Letters to Western Europe and the USA can take between two weeks and two months. Stamped envelopes can be bought from post offices. Addresses should be laid out in the following order: country, postcode, city, street, house number and, lastly, the person's name. There are a number of international courier services based in Tashkent.